Another no-picture post because I don’t want to sort through the 550 pictures I took over the past week. Eek! Emmie’s first Christmas was in Michigan with Peter’s family. She LOVED it and loved having so many people loving her (spoiled in the best kind of way). It was bittersweet, as it was the first Christmas without Grandma Emmi, but it was still wonderful. We even got to visit with my aunt, uncle and cousin in an impromptu trip to Ohio! Overall, lots of delicious food and wonderful company, and I got some great pictures of it all happening. Speaking of food, Emmie is now TOTALLY ready to start eating food (does rice cereal count as solids? Anyway, she’s ready for food other than milk). I wasn’t sure if she ever would be, but she definitely got there while we were in Michigan! We keep joking that we came home with a different baby than we left with, which is awesome and also terrifying (we are now solidly in the stage of needing to keep everything out of her reach). We are all somewhat dazed today from our travel yesterday (I’m actually the only being awake in the house now). Yesterday, we woke up at 1:30 AM Colorado time (3:30 Ohio time) for a 7 AM flight, and by the time we made it home at about 10:30 AM, we had traveled by plane, train and automobile, and somehow all made it home in one piece and relatively sane. And then we napped. A LOT. We are all still recovering today. Lots more to write about, including Emmie’s newfound infatuation with cats, my AMAZING trip to Amish country in MI, and super cute pictures of Emmie (of course!). But now, off to tackle the mountain of laundry! As a bonus, here is a picture Peter took of me and Emmie on a walk at Peter’s parents’ house. 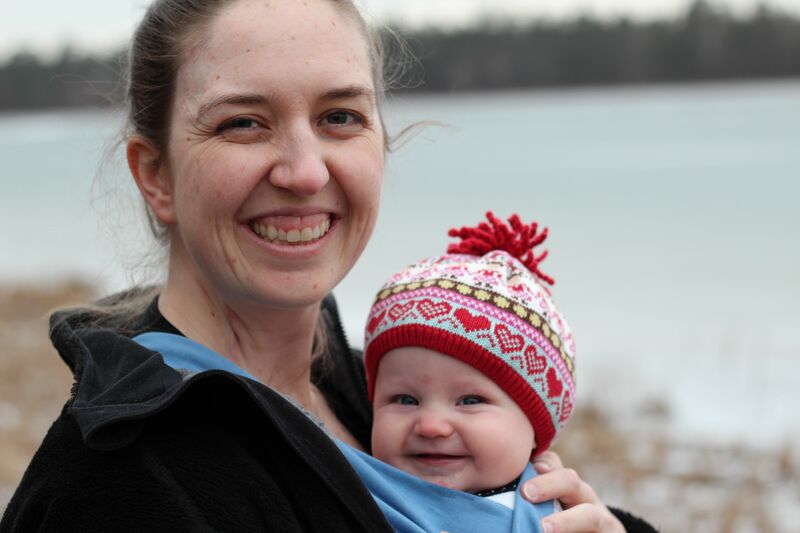 (I feel like this is our first real “mommy/daughter” picture, since we are both smiling and looking at the camera!). OMG this has to be the CUTEST mother/daughter pics in the history of all mother/daughter pics far and wide!!! Many and abundant rich and very healthy blessings to you, Peter, Emmie, and Jasper (and to G, Jack, and PJ as well, if they ever read this post comment! )!